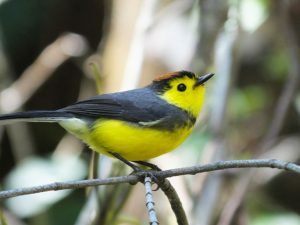 Many a road in Costa Rica leads to great destinations for birding. Given this country’s small size and abundance and variety of avian life, that’s pretty much inevitable. Nevertheless, if you don’t have a whole lot of time to work with, or, most likely, just don’t feel like messing around with seeing museums, golfing, or lounging around the hotel when there are multiple lifers to be had, a birder can’t help but want to see those birds and like, well, now! 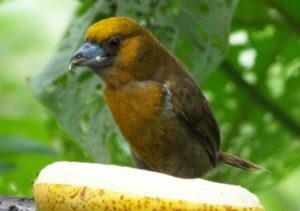 Much to the fortune of every type of birder, there is one easy and relatively quick route that can be taken straight to the heart of local endemism in Costa Rica. Of the two principle avian endemic regions in this nation of birds and smiles, the highlands are within sight and easy reach from the Central Valley. That valley would be the one with all the houses, buildings, and vehicles, the one that you fly in to, and the one that every birder would rather exit as soon after arrival as possible. Although you could zip on down to the coast and see Scarlet Macaws and several regional endemics among myriads of other birds, I’ll be writing about that other endemic bird area in another post. For now, likely inspired by a fine day of guiding in the nearby highlands yesterday, I’ll be talking about the route that goes from the populated Central Valley to the highlands of Poas and on over to the wetter forests of the Caribbean slope. The road in question is route 126, a name that will actually make no sense whatsoever due to the general lack of road signs in Costa Rica but that is the official name. If I were going to give it a name, I guess I might call it, “Endemic Bird Way Numero Uno”, or maybe, “Via Endemica”. Yeah, I like the sound of that latter one. “Via Endemica” it shall be as that gives a fair description of what can be found along the curves and dips of this birdy way. There are a few main means to access it, but as long as you eventually find yourself in Varablanca, you will be on the right birding track. Personally, I prefer the route that passes through Los Cartagos because this is closer to my house but if I were coming from the airport, I would take the route through Fraijanes. However, before letting Waze guide you up the flanks of the volcano, I suggest making another, very important stop first, one to look for Costa Rica’s latest endemic bird. 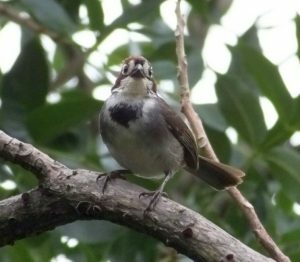 Although it’s been here much longer than Homo sapiens, we didn’t recognize the Cabanis’s Ground-Sparrow for being the full species that it is until Tico ornithologist Luis Sandoval did the work to show that this distant relative of the Canyon Towhee does indeed only belong to Costa Rica. This means that you really don’t want to go home without seeing one, especially because it’s a fancy little bird! Like a sparrow that decided to go clown, it shows its colors in the coffee fields and whatever remaining habitats it can find in the Central Valley. Since it’s probably endangered, yeah, you might want to see it even more. Look for it in coffee fields at various sites, or just hire me to show this and a hundred other birds during a day on the Via Endemica. After hopefully laying eyes on this beautiful little skulker, ascending the Via Endemica leads to an increasingly higher percentage of near endemics (“near” because the only other place where they occur is western Panama). Since they actually live in an area smaller than New Jersey, I think I’ll just refer to these special birds as “endemic”. Although you could run into Scintillant Hummingbird and a couple other endemics on the drive up, most are birds of the cloud forests. Bird any forest in the Poas area and you have a chance at seeing everything from the lovely little Flame-throated Warbler to the one and only blue-faced bird with the ruby eyes, the Black Guan. Throw the mega Resplendent Quetzal into the mix and we are talking about some seriously satisfying birding. Heading over to Varablanca, you might catch more highland endemics while buying a coffee or snacks in one of the stores at the crossroads to the lowlands. That would be the spot where the gas (petrol) station is situated. Seriously, keep an eye out, I have seen a lot of nice birds right there including Yellow-bellied Siskin, silky-flycatchers, and Golden-browed Chlorophonia among others. There might not be as many now that some of the habitat has been cleared (destroyed) but incidental singing Collared Redstart and Flame-colored Tanager from the parking lot last week was a reminder that some are still around. The redstart is one pretty little bird. As we descend to lower elevations, we reach more territories of Dark Pewee, Golden-bellied Flycatcher, and other endemics including Sooty-faced Finch at the waterfall. Keep going and we eventually reach the middle elevations and foothill zone of Cinchona and Virgen del Socorro. Although the percentage of endemic birds decreases by this point, the birding can still produce a fine mix of subtropical species along with major endemic goodies like Blue-and-gold Tanager, Lattice-tailed Trogon, and maybe even Black-breasted Wood-Quail or Red-fronted Parrotlet. 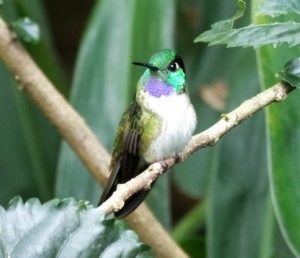 And if you just want to hang with some hummingbird action, this is also found on the Via Endemica at the La Paz Waterfall Gardens, the Cafe Colibri (now known as the Mirador Catarata San Fernando), and maybe one or two other sites. 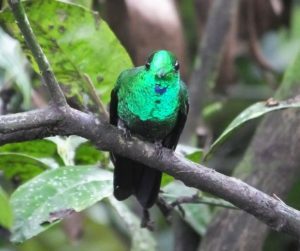 Yesterday, the endemic Coppery-headed Emerald was the most frequent hummingbird at feeders also frequented by the tiny Green Thorntail, the hulking amethyst and white Violet Sabrewing, and the Easter candy colored White-bellied Mountain-gem. As usual, Green-crowned Brilliants were also present. This one flashed its headlights at just the right moment. It reminds me of Easter, maybe it’s the jelly beans. Although the Via Endemica offers all of these species and more, a birder still has to know where and how to look for them. Need some help in birding the Via Endemica? Send me an email at information@birdingcraft.com.